June 6, 2017: The rhythms of sea ice play a central role in many communities along Hudson Bay, the shallow inland sea in northern Canada. This is particularly true for Sanikiluaq, an Inuit town on one of the Belcher Islands in the southeastern part of the Bay. 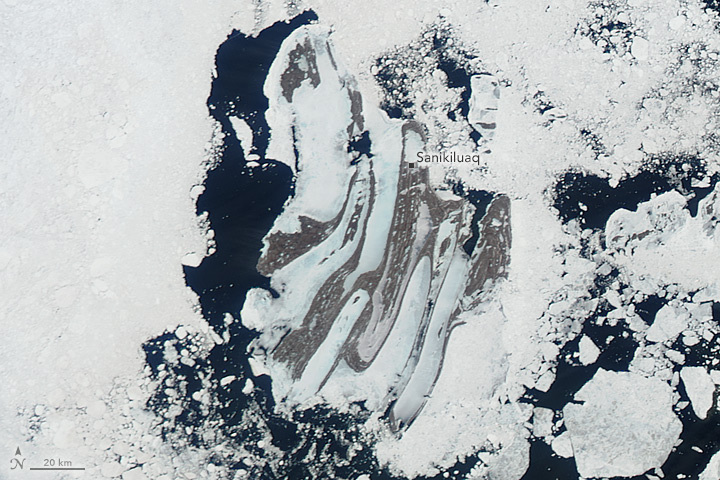 Every year, the Belcher Islands cycle through periods dominated by ice and then by open water. Thick layers of sea ice enclose the islands during the winter. As longer and warmer days arrive in May and June, ice begins to thaw and break up. By July, the islands are usually ice free. On May 28, 2017, the Moderate Resolution Imaging Spectroradiometer (MODIS) on NASA’s Aqua satellite captured this image of the Belcher Islands. Landfast ice (anchored to the shore) still filled many of the inlets, but areas of open water called polynyas had emerged around the island group. 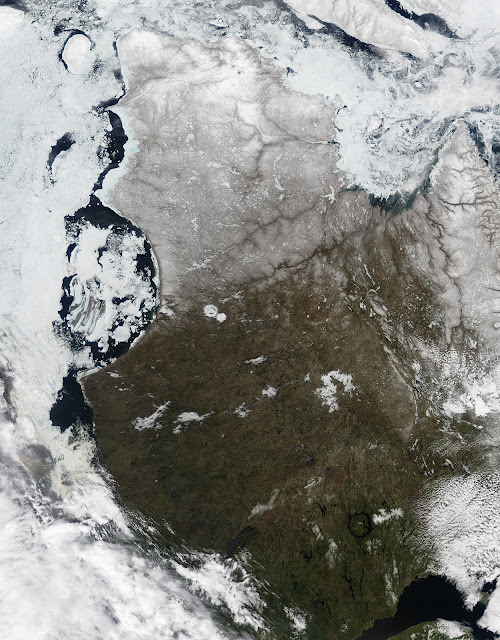 Beyond the polynyas, pack ice still filled much of Hudson Bay. The cool climate makes large-scale farming impossible on the Belcher Islands. Instead, hunting and fishing are central to the town’s economy. The many inlets of the islands make good habitat and nesting grounds for ducks, whales, walruses, seals, and fish. As a result, Inuit hunters have become expert at tracking migratory animal communities on foot, boat, and snowmobile. In some cases, this involves taking advantage of currents and floes of floating ice to reach areas where wildlife congregates. As climate changes and the behavior of sea ice has become less predictable, this task has become more complex and dangerous. That is an insight shared by veteran hunters who described their observations for the Sanikiluaq Sea Ice Project. The interviews were part of a broader effort supported by the National Science Foundation that facilitates the collection, preservation, and exchange of information about environmental change as observed by indigenous communities in the Arctic. The researchers have posted interviews and labeled MODIS-based maps on a web site that detail the observations of changing ice conditions. As we have previously reported, the timing of sea ice breakup in some parts of Hudson Bay has changed, with melting occurring a few weeks earlier in the spring. Some researchers project that future warming in this region could reduce the duration of ice-covered conditions by seven to nine weeks per year. The changes are projected to be the most pronounced in southeastern Hudson Bay.